See the cartridge and packaging in the following photo? 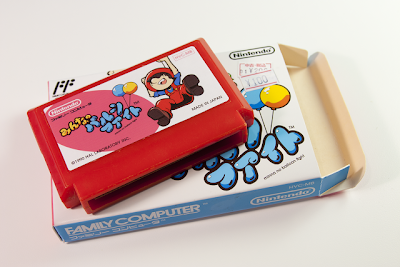 They're not of a real Famicom game, sadly. Instead, they're the products of the fertile imagination of the Ribbon Black blog's Nightmare Bruce. Although I initially wanted to strangle Bruce after coming across these creations--because, really, who wouldn't kill (or at least consider doing so) to experience a four-player "battle royal" version of Nintendo's arcade and console classic?--but eventually I got over my Balloon Fight rage and decided I was happy someone not only came up with such an idea but was able to follow through with it and concoct the box and cart seen below. To see more photos of Minna no Balloon Fight's box and cart--and even a blurry screenshot of this faux Famicom game--head on over to the Ribbon Black blog at your earliest convenience. Oh, and if you've like to see a handful of (also fake) screens that don't look like they've been covered in Vaseline, check out this post on Nightmare Bruce's simply AWFUL tumblog. Sweet! Thanks for introducing me to this new Tumblr! I want this game to be a real game. So. Bad. You should be grateful that is not a real game, because probably you will end in a prison ha ha ha. Well, yes, that's true. Maybe they'd allow me to bring the game and a portable Famicom into the prison with me? Whoa, I was surprised to see the bump in traffic today! Thank you very much for the feature! And sorry for sending you into a balloon fueled rage--that seems to happen to people when I post sometimes, haha. That blurry screenshot was me wanting to make it look as if it were running on my tv...unfortunately my computer can't output to my old CRT set so it was still being displayed on a widescreen, computer monitor-like lcd tv. Putting it on my little 11-inch Trinitron would have been a lot more charming and convincing, if I had the means to do it. Glad I could give you a bump in traffic! Also, no worries about the blurry screenshot--I thought that was what you were going for. As for the direct link to your Tumblr post about the game, etc: no problem at all! I'd be really curious to see how he makes boxes like that! I like that aspect of Bruce's mock-ups, too, Anne. I'm also curious as to how he makes these boxes--assuming he actually makes them and they're not just photoshops (?? ).